Sydney’s time-travelling DJ and perennial party monster, Hot Dub Time Machine, has announced his only Australian tour dates for 2015, with six shows to take place after his appearances at Groovin The Moo 2015. The last twelve months have seen Hot Dub Time Machine play huge sets at Sydney Festival, Falls Festival and Splendour In The Grass, as well as at international festivals. He’s set to play Groovin The Moo in April and May, and will follow it up with headline shows in Sydney, Brisbane, Perth, Melbourne, Darwin and Hobart across May and June. 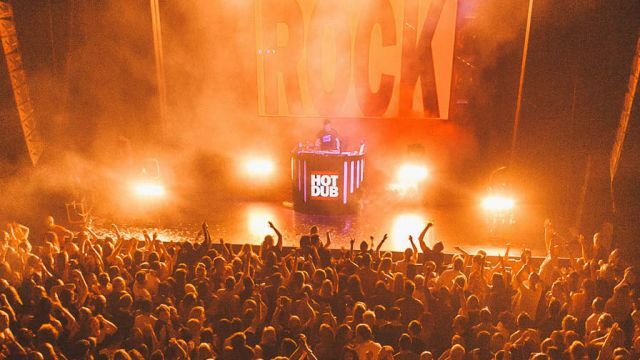 Hot Dub most recently toured Australia with his Biggest. Tour. Ever. in October and November. His last two national tours have seen shows completely sell out, so fans will need to get in quick to secure their tickets to the musical world of time-travel. Hot Dub Time Machine’s 2015 Australian tour begins in Sydney on Thursday, 14th May. Tour and ticket details are available below. UPDATE 28/04/15: Hot Dub Time Machine has announced the Adelaide Festival Of Hot Dub, which will take place this June. He has also added extra Sydney and Perth dates to his forthcoming national tour. Updated details are available below. Tickets on sale now via the Hot Dub Time Machine website.